Catherine of Aragon, Queen of King Henry VIII of England, daughter of Ferdinand and Isabella of Spain, was born on the 15th or 16th of December 1485. She left Spain in 1501 to marry Arthur, Prince of Wales, eldest son of King Henry VII, and landed at Plymouth on the 2nd of October. The wedding took place on the 14th of November in London, and soon afterwards Catherine accompanied her youthful husband to Wales, where, in his sixteenth year, the prince died on the 2nd of April 1502. On the 25th of June 1503, she was formally betrothed to the king's second son, Henry, now Prince of Wales, and a papal dispensation for the alliance was obtained. The marriage, however, did not take place during the lifetime of Henry VII. Ferdinand endeavored to cheat the English king of the marriage portion agreed upon, and Henry made use of the presence of the unmarried princess in England to extort new conditions, and especially to secure the marriage of his daughter Mary to the Archduke Charles, grandson of Ferdinand, and afterwards Charles V. Catherine was thus from the first the unhappy victim of state politics. Writing to Ferdinand on the 9th of March 1509, she describes the state of poverty to which she was reduced, and declares the king's unkindness impossible to be borne any longer. On the old king's death, however, a brighter prospect opened, for Henry VIII decided immediately on marrying her, the wedding taking place on the 11th of June and the coronation on the 24th. 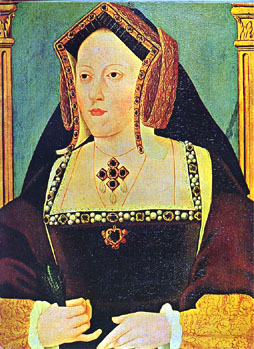 Catherine now enjoyed a few years of married happiness; Henry showed himself an affectionate husband, and the alliance with Ferdinand was maintained against France. She was not without some influence in state affairs. During Henry's invasion of France in 1513 she was made regent; she showed great zeal and ardor in the preparations for the Scottish expedition, and was riding towards the north to put herself at the head of the troops when the victory of Flodden Field ended the campaign. The following year an affectionate meeting took place between the king and queen at Richmond on the return of the former. Ferdinand's treachery, however, in making a treaty with France roused Henry's wrath, and his angry reproaches fell upon his unfortunate wife; but she took occasion in 1520, during the visit of her nephew Charles V to England, to urge the policy of gaining his alliance rather than that of France. Immediately on his departure, on the 31st of May 1520, she accompanied the king to France, on the celebrated visit to Francis I, called from its splendor the Field of the Cloth of Gold; but in 1522 war was declared against France and the emperor again welcomed to England. In 1521 she is represented by William Shakespeare as pleading for the unfortunate Duke of Buckingham. These early years of happiness and of useful influence and activity had, however, been gradually giving way to gloom and disappointment. Between January 1510 and November 1518 Catherine gave birth to six children (including two princes), who were all stillborn or died in infancy except Mary, born in 1516, and rumor did not fail to ascribe this series of disasters to the curse pronounced in Deuteronomy on incestuous unions. In 1526 the condition of Catherine's health made it highly improbable that she would have more children. No woman had ever reigned in England, alone and in her own right, and to avoid a fresh dispute concerning the succession, and the revival of the civil war, a male heir to the throne was a pressing necessity. The act of marriage, which depended for its validity on the decision of the ecclesiastical courts, had, on account of the numerous dissolutions and dispensations granted, not then attained the security since assured to it by the secular law. For obtaining dissolutions of royal marriages the facilities were especially great. Pope Clement VII himself permitted such a dissolution in the case of Henry's own sister Margaret, in 1528, proposed later as a solution of the problem that Henry should be allowed two wives, and looked not unfavorably, with the same aim, on the project for marrying the duke of Richmond to Mary, a brother to a sister. In Henry's case also the irregularity of a union, which is still generally reprobated and forbidden in Christendom, and which it was very doubtful that the pope had the power to legalize, provided a moral justification for a dissolution which in other cases did not exist. It was not therefore the immorality of the plea which obstructed the papal decree in Henry's favor, but the unlucky imprisonment at this time of Clement VII at the hands of Charles V, Catherine's nephew, which obliged the pope, placed thus "between the hammer and the anvil", to pursue a policy of delay and hesitation. Nor was the immorality of Henry's own character the primary cause of the project of divorce. Had this been so, a succession of mistresses would have served as well as a series of single wives. The real occasion was the king's desire for a male heir. But, however clear this may be, the injustice done to Catherine was no less cruel and real. Rumors, probably then unfounded, of an intended divorce had been heard abroad as early as 1524. But the creation in 1525 of the king's illegitimate son Henry, as Duke of Richmond -- the title borne by his grandfather Henry VII -- and the precedence granted to him over all the peers as well as the princess Mary, together with the special honor paid at this time by the king to his own half-sister Mary, were the first real indications of the king's thoughts. In 1526, and perhaps earlier, Thomas Wolsey had been making tentative inquiries at Rome on the subject. In May 1527 a collusive and secret suit was begun before the cardinal, who, as legate, summoned the king to defend himself from the charge of cohabitation with his brother's wife; but these proceedings were dropped. On the 22nd of June Henry informed Catherine that they had been living in mortal sin and must separate. During Wolsey's absence in July at Paris, where he had been commissioned to discuss vaguely the divorce and Henry's marriage with Ren�e, daughter of Louis XII, the name of Anne Boleyn is first heard of in connection with the king, his affection for her having, however, begun probably as early as 1523, and the cardinal on his return found her openly installed at the court. In October 1528 the pope issued a commission to Cardinal Campeggio and Wolsey to try the cause in England, and bound himself not to revoke the case to Rome, confirming his promise by a secret decretal commission which, however, was destroyed by Campeggio. But the trial was a sham. Campeggio was forbidden to pronounce sentence without further reference to Rome, and was instructed to create delays, the pope assuring Charles V at the same time that the case should be ultimately revoked to Rome. The object of all parties was now to persuade Catherine to enter a nunnery and thus relieve them of further embarrassment. While Henry's envoys were encouraged at Rome in believing that he might then make another marriage, Henry himself gave Catherine assurances that no other union would be contemplated in her lifetime. But Catherine with courage and dignity held fast to her rights, demanded a proper trial, and appealed not only to the bull of dispensation, the validity of which was said to be vitiated by certain irregularities, but to a brief granted for the alliance by Pope Julius II. Henry declared the latter to be a forgery, and endeavored unsuccessfully to procure a declaration of its falsity from the pope. The court of the legates accordingly opened on the 31st of May 1529, the queen appearing before it on the 18th of June for the purpose of denying its jurisdiction. On the 21st both Henry and Catherine presented themselves before the tribunal, when the queen threw herself at Henry's feet and appealed for the last time to his sense of honor, recalling her own virtue and helplessness. Henry replied with kindness, showing that her wish for the revocation of the cause to Rome was unreasonable in view of the paramount influence then exercised by Charles V on the pope. Catherine nevertheless persisted in making appeal to Rome, and then withdrew. After her departure Henry, according to Cavendish, Wolsey's biographer, praised her virtues to the court. "She is, my lords, as true, as obedient, as conformable a wife as I could in my phantasy wish or desire. She hath all the virtues and qualities that ought to be in a woman of her dignity or in any other of baser estate." On her refusal to return, her plea was overruled and she was adjudged contumacious, while the sittings of the court continued in her absence. Subsequently the legates paid her a private visit of advice, but were unable to move her from her resolution. Finally, however, in July 1529, the case was, according to her wish, and as the result of the treaty of Barcelona and the pope's complete surrender to Charles V, revoked by the pope to Rome: a momentous act, which decided Henry's future attitude, and occasioned the downfall of the whole papal authority in England. On the 7th of March 1530 Pope Clement issued a brief forbidding Henry to make a second marriage, and ordering the restitution of Catherine to her rights until the cause was determined; while at the same time he professed to the French ambassador, the bishop of Tarbes, his pleasure should the marriage with Anne Boleyn have been already made, if only it were not by his authority. The same year Henry obtained opinions favorable to the divorce from the English, French and most of the Italian universities, but unfavorable answers from Germany, while a large number of English peers and ecclesiastics, including Wolsey and Archbishop William Warham, joined in a memorial to the pope in support of Henry's cause. Meanwhile, Catherine, while the great question remained unsolved, was still treated by Henry as his queen, and accompanied him in his visits in the provinces and in his hunting expeditions. On the 31st of May 1531 she was visited by thirty privy councillors, who urged the trial of the case in England, but they met only with a firm refusal. On the 14th of July Henry left his wife at Windsor, removing himself to Woodstock, and never saw her again. In August she was ordered to reside at the Moor in Hertfordshire, and at the same time separated from the princess Mary, who was taken to Richmond. In October she again received a deputation of privy councillors, and again refused to withdraw the case from Rome. In 1532 she sent the king a gold cup as a new year's gift, which the latter returned, and she was forbidden to hold any communication with him. Alone and helpless in confronting Henry's absolute power, her cause found champions and sympathizers among the people, among the court preachers, and in the House of Commons, while Bishop Fisher had openly taken her part in the legatine trial. Subsequently Catherine was removed to Bishops Hatfield, while Henry and Anne Boleyn visited Francis I. Their marriage, anticipating any sentence of the nullity of the union with Catherine, took place after their return about the 25th of January 1533, in consequence of Anne's pregnancy. On the 10th of May Thomas Cranmer, for whose consecration as Archbishop of Canterbury Henry had obtained bulls from Rome, opened his court, and declared on the 23rd the nullity of Catherine's marriage and the validity of Anne's. On the 10th of August the king caused proclamation to be made forbidding her the style of queen; but Catherine refused resolutely to yield the title for that of princess-dowager. Not long afterwards she was removed to Buckden in Huntingdonshire. Here her household was considerably reduced, and she found herself hemmed in by spies, and in fact a prisoner. In July she had refused Henry the loan of a certain rich cloth, which had done service at the baptism of her children, for the use of Anne Boleyn's expected infant; and on the birth of Elizabeth and the refusal of Mary to give up the title of princess, the latter's household was entirely dismissed and she herself reduced to the position of attendant in Elizabeth's retinue. A project for removing Catherine from Buckden to Somersham, an unhealthy solitude in the isle of Ely, with a still narrower maintenance, was only prevented by her own determined resistance. The attempt in November to incriminate the queen in connection with Elizabeth Barton failed. She passed her life now in religious devotions, taking strict precautions against the possibility of being poisoned. On the 23rd of March 1534 the pope pronounced her marriage valid, but by this time England had thrown off the papal jurisdiction, the parliament had transferred Catherine's jointure to Anne Boleyn, and the decree had no effect on Catherine's fortunes. She refused to swear to the new act of succession, which declared her marriage null and Anne's infant the heir to the throne, and soon afterwards she was removed to Kimbolton, where she was well treated. On the 21st of May she was visited by the archbishop of York and Tunstall, bishop of Durham, who threatened her with death if she persisted in her refusal, but only succeeded in confirming her resolution. She was kept in strict seclusion, separated from Mary and from all outside communications, and in December 1535 her health gave way, her death taking place on the 8th of January 1536, not without suspicions of poison, which, however, may be dismissed. She was buried by the king's order in Peterborough cathedral. Before her death she dictated a last letter to Henry, according to Polydore Vergil, expressing her forgiveness, begging his good offices for Mary, and concluding with the astounding assurance -- "I vow that mine eyes desire you above all things." The king himself affected no sorrow at her death, and thanked God there was now no fear of war. Catherine is described as "rather ugly than otherwise; of low stature and rather stout; very good and very religious; speaks Spanish, French, Flemish, English; more beloved by the islanders than any queen that has ever reigned." She was a woman of considerable education and culture, her scholarship and knowledge of the Bible being noted by Erasmus, who dedicated to her his book on Christian Matrimony in 1526. She endured her bitter and undeserved misfortunes with extraordinary courage and resolution, and at the same time with great womanly forbearance, of which a striking instance was the compassion shown by her for the fallen Wolsey.